DELLA ROMA MODERNA, CAPITALE D'ITALIA, È STATO DETTO DI AVERE UN PIEDE NEL PASSATO E UNO NEL PRESENTE, CON 2.000 ANNI DI RELIQUIE CHE AFFIANCANO LE AFFASCINANTI MODE DELLA SOCIETÀ ATTUALE. 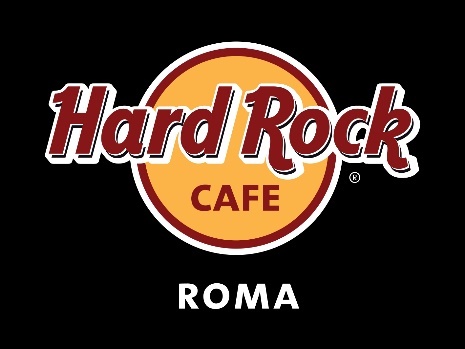 ABBIAMO RIFLESSO QUESTA SENSAZIONE NEL NOSTRO HARD ROCK CAFE CON DEI PRODOTTI DI ABBIGLIAMENTO DI TENDENZA TARGATI HARD ROCK, E UN VERO E PROPRIO COLOSSEO DI CIMELI MUSICALI. ALCUNI PARTICOLARI DELLA ROMA CLASSICA VI RICORDERANNO LA MERAVIGLIOSA DESTINAZIONE CHE STATE VISITANDO, TRA CUI I SOFFITTI FINEMENTE DIPINTI E LE COLONNE IN STILE CORINZIO. SE CERCATE IL MIGLIOR HAMBURGER DI ROMA, NON DOVETE FARE ALTRO CHE ENTRARE NEL TEMPIO DEL ROCK DI VIA VITTORIO VENETO, SCOPRIRETE CHE LA CUCINA AMERICANA DI QUALITÀ È RICCA DI PIATTI GUSTOSI E AUTENTICI. 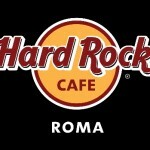 IL MENU DEL RISTORANTE MUSEO POSIZIONATO AL CENTRO DELLA STRADA DELLA DOLCE VITA È PARTE INTEGRANTE DELLA MIGLIORE OFFERTA CULINARIA DELLA CITTÀ E SI ABBINA PERFETTAMENTE ALL'ESCLUSIVA ED ENERGETICA ATMOSFERA CHE RENDE GLI HARD ROCK CAFE UNICI AL MONDO. POTRETE GUSTARE UN LEGENDARY BURGER O UN PIATTO DELLA SMOKEHOUSE SELECTION (LA DELIZIOSA CARNE AFFUMICATA), FARVI PREPARARE UN COCKTAIL DAI NOSTRI TALENTUOSI BARTENDERS E COMPRARE UN REGALO O UN SOUVENIR DA COLLEZIONARE, AMMIRANDO LE NOSTRE MEMORABILIA MUSICALI ORIGINALI APPARTENUTE ALLE PIÙ FAMOSE ROCKSTARS E ASCOLTANDO LA MIGLIORE MUSICA DI TUTTI I TEMPI. 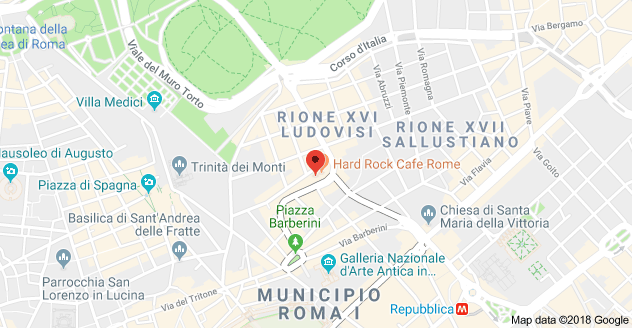 VISITARE L'HARD ROCK CAFE ROMA E GUSTARE UNO DEI NOSTRI PIATTI DIVENTERÀ COME LANCIARE UNA MONETINA NELLA FONTANA DI TREVI: UN "MUST" IN OGNI VOSTRA VISITA ALLA CAPITALE!